Andrew Napier’s chronicle of the unlikely career of one of the world’s most popular online news hosts made its debut at Hot Docs last year, where it picked up a media award. It also screened at Santa Barbara. It now comes to theatres in New York City and Los Angeles, and to VOD platforms including Amazon Instant Video, Google Play, iTunes, Playstation, Vudu, Xbox, and YouTube, as well as Brighthouse, Clearleap, Comcast (Xfinity), Cox, RCN and Time Warner Cable. 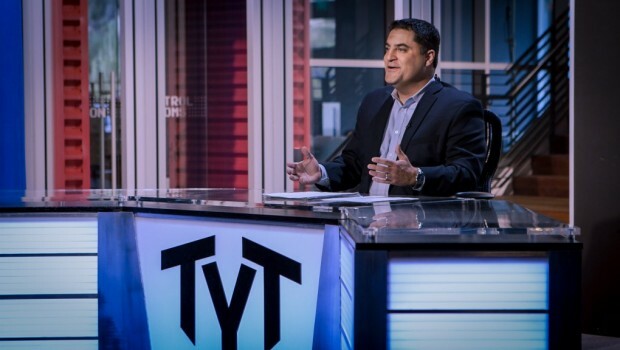 Napier’s film focuses on the Young Turks, a political news program which has drawn over two billion views on YouTube since its inception, and, in particular, its founder and primary host, Cenk Uygur, a Turkish immigrant who abandoned a legal career to pursue a talk show dream. Napier reveals his unusual story, revealing his transformation from moderate Republican to liberal Democrat to a progressive critical of both parties and of corporate personhood – all the while avoiding hagiography to present the affable figure in a more rounded manner. As Uygur and the Young Turks’ popularity grows, so to do the opportunities to infiltrate mainstream media – but, as the film shows, this comes with a cost that Uygur may not be willing to concede. Napier offers an engaging look at media and political criticism through the ups and downs of the Young Turks program, revealing the possibilities, and limits, of new media.